Rikyu's saying 'It is interesting to hang a scroll on a rough wall' has come down to us. 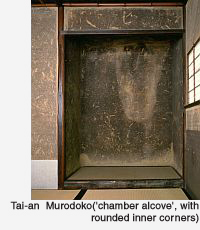 It was customary to have just the walls of the alcove covered with paper, but Rikyu changed the surface to clay. He insisted that it was alright to hang important scrolls on a clay wall. Because of this all of the walls of the tea room became clay. Plastering walls with clay had been done since long ago. The walls of residences and shrines and so on were finished with shikkuinuri. This was a material used only in Japan to plaster walls. Glue and brine are added to slaked lime and waste thread and clay are kneaded into it. Tea rooms, however, were plastered with clay only. In Tai-an, in order to bring out the artlessness of rough walls, pieces of straw were sprinkled on the surface. This also helped to prevent the surface from cracking. In Kyoto a kind of clay called Jurakutsuchi was produced which had a strong flavour. It is a brown clay found in remains of Toyotomi Hideyoshi's Jurakudai Villa and its surroundings. This is mixed with water and used as plaster to make a really strong wall. The colour of clay, the feel of clay, the fragrance of clay, and the inexpressible character of a clay wall that gives off an aroma, were welcomed by chanoyu. Then this kind of clay wall was widely used outside the tea room in residential architecture. Alcoves these days mostly have clay walls. It was Rikyu's tea room that paved the way for this to happen. Along with paper and wood, clay is a material that breathes, and is most suitable for the climate of Japan.